Measuring a space correctly is key to buying new appliances, cabinets and furniture. Make sure to measure spaces from every angle because wall openings can vary from front to back. Remodeling is a big undertaking, and homeowners aren’t typically well versed in it. No one wants to make a mistake that will be costly or delay a project start or end date. 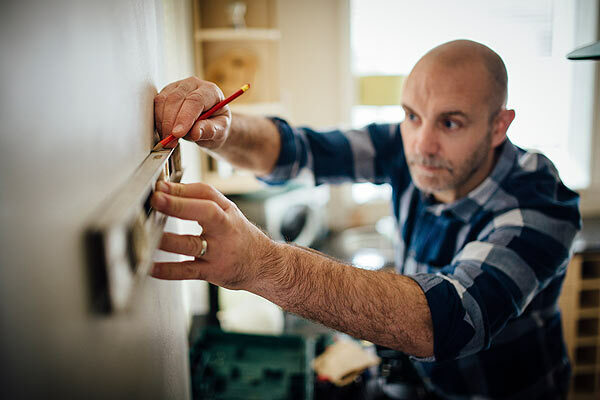 To help your renovation project stay on track, here are five of the most common errors that owners make and how to avoid them. 1. Tearing out the space before you have a definitive plan. 2. Failing to allot an extra 20 percent in your budget. Unforeseen problems – asbestos, outdated electrical wiring, a water leak – crop up midway in most renovations. So it’s standard to budget an extra 20 percent to cover these surprises. Adding in the extra money from the start will be less aggravating than having to lay out the dough later. 3. Acting as your own general contractor. It may look like something that a detail-oriented person can do. But if you have no experience handling a major renovation, don’t sign on for the job of GC. “There’s a lot of thought and planning that goes into any project,” Flatley says. “Without knowing the proper sequence of scheduling the appropriate tradespeople or subcontractors, you can cost yourself a lot of extra money, time and frustration.” What’s more, “the electrician and the plumber don’t always play nice and don’t like getting in each other’s way.” A tradesperson who walks off a site because you’re not ready for him to do his job is costly and rescheduling frustrating. 4. Failing to measure the space correctly – or at all. If you measure two walls in one room, the difference from one wall to the other can be 1/2 inch or more. If you measure between the back of a wall and an opening, it also may be off from the front measurement by as much as ½ inch. For example, say you have a refrigerator between two walls—the distance on the back wall may be 35 1/4 inches while the dimensions at the front may be 36 1/2 inches, Flatley says. So that built-in 36” refrigerator you ordered won’t fit. You’ll be stuck with an appliance you can’t use. Or you’ll have to pay a hefty restocking charge to return the fridge to the store. 5. Purchasing an appliance without getting all of the electrical or plumbing specs. It’s easy to purchase an insta-hot or water filtration system, says Flatley. But if you don’t have the required electrical outlet or right size water line, it won’t work. “Sometimes things can be changed to make it work, but it’s an add-on or ‘change order.’ Which ends up costing a lot more than if detailed specs had been checked prior to purchase.” To avoid any missteps, find out all the requirements before purchasing. Looking for a way to organize all your product selections during your home project? Find out how HomeOnTrack can take the stress out of this process!